Ugh. Good morning to you too. Apparently this week is Diabetes Week. If I get the chance I will try to rattle in a post about the excellent #languagematters work that is being launched this week which hopefully will provide useful pointers to healthcare professionals and people living with diabetes who are trying to have more positive, more enabling, less stigmatising conversations. In the meantime I have other things on my mind. Because as I posted recently on Twitter my diabetes has been behaving in a peculiarly cantaknerous way recently and I don't see why I should suffer that alone, so I'm inflicting it on you lot. We've toyed with a few different straplines for our blog over the years, before we settled on the current one, "Because no two days with type 1 diabetes are the same. Except when they are." Which I liked because it was a) slightly annoying and b) didn't really make much sense. Both attributes shared by type 1 diabetes itself. It is part of the unending joy of playing at being your own pancreas that you are perpetually caught in the tension between the illusion of 'diabetes maths' (deliver x units of insulin to process y grams of carbohydrate plus or minus z percent for activity/illness/alcohol/whatever) and the reality of living with a condition where the sheer bewildering number of variables that might combine, contradict, multiply or cancel each other out, when trying to calculate a precise (or sometimes wildly guessed) insulin dose, mean that it can be extremely difficult to work out why things have gone well, or not quite so well. As a defence, some of us pancreas pretenders with a few years under our belts attempt to find some ways of reducing the number of variables without expiring from sheer boredom. It's a kind of coping strategy and it can work quite well up to a point. I have eaten pretty much the same breakfasts and lunches for more years than I care to remember. A regular rhythm with slight differences for weekdays and weekends (craziness!) but generally, more often than not, a known number of slices of a single brand of bread along with a medium-sized apple at lunchtime, and a not very adventurous range of fillings/toppings. It is functional eating. Designed to be predictable. Well tested. Evening meals I tend to eat a much wider variety. And this regularity provides a useful touchpoint. Because as I said this strategy is only successful 'up to a point'. And that point is where something else changes. You have the normal food, you take the normal dose alongside the normal background insulin and the normal level of activity. But suddenly you see anything but normal blood glucose outcomes. If everything is changing all the time, with all sorts of different meal choices/fat contents/dose requirements, it is much harder for me to spot when my diabetes has joyfully shifted the goalposts (again!) and when I need to slightly adjust basal dose or meal/correction ratios. I've been happily using this technique for years now. And my diabetes and I have got into a sort of gently seething stalemate. I fix the ratios/basal/correction factor. A week or two pass... a small basal tweak is required... then another... then another... And every month or three perhaps a larger overhaul might be required. The basal pattern might slightly change shape, or carb ratios and correction factors may need to be adjusted. Blood glucose normality (Ha! By which I mean the generally expected levels of BG chaos) resumes. Up a bit... Down a bit... Down a bit... Back up a bit. And so my diabetes world turns. More recently I have been seeing something much more unusual, unexpected and irritating going on. But such is the chaotic and fickle nature of living with type 1 diabetes, that it's taken me a while to even spot it was happening, and realise that over the past 2-3 months it has been developing into a bit of a pattern. In a sense, I wonder if I might have spotted it sooner if I'd had less access to CGM. It sounds bizarre, but the difference for me between living with CGM and living without it is that CGM frees me from needing my diabetes to behave predictably. I am able to roll with it and adjust as I am going along much more freely. But that freedom, ironically, may come at a price. Without CGM, I need my diabetes to be much better behaved. I need to know that I can do x and (more or less) expect y to happen without watching it unfold, or being alerted if things are going off-track. I've only been wearing CGM occasionally this year, but it's probably been 50-60% of the time. And that's a lot of weeks of 'adjusting on the go'. Having run sensor-free for 2-3 weeks I realised how much I had lost my fingerstick BG mojo (especially after a full year with quite heavy CGM/Libre use in 2017). When the weirdness started happening and I was wearing sensors I just worked around it. It has only been since running sensor-free for a few weeks that I've needed to look at the root cause to try to get things back onto an even keel when I'm not able to watch what's going on between the dots. What seems to be happening for me recently, at lunchtime and even moreso for evening meals, is that the speed of absorption of previously predictable meals has substantially changed. While I used to be able to take doses all up front with 20-30 minute delay before eating at lunchtime, and immediately before eating evening meals, I am now needing to use dual waves to substantially delay insulin delivery so that the late arriving food still has insulin available. 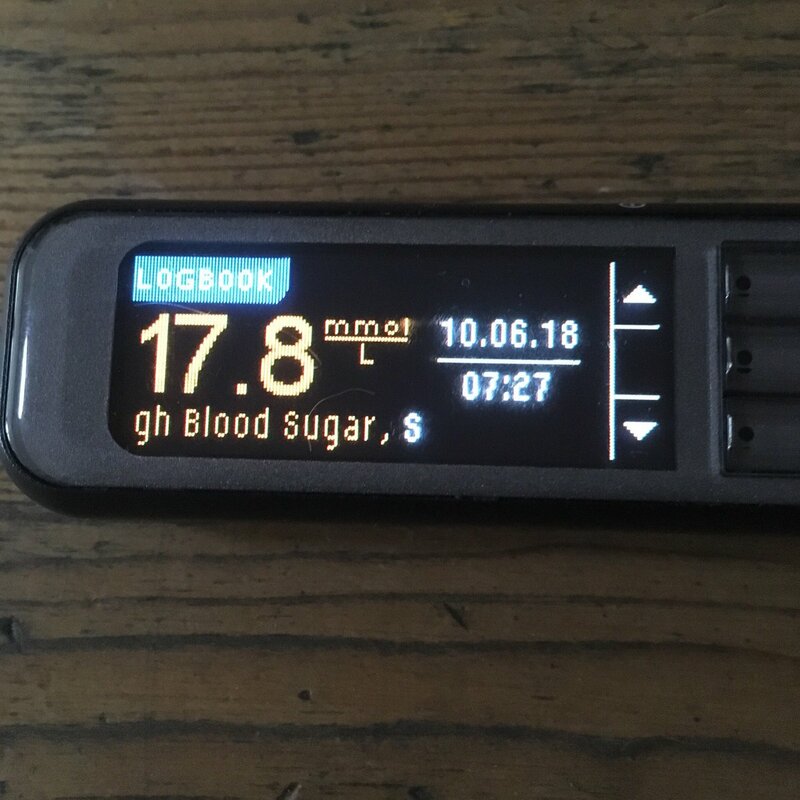 What had been happening was a post-meal period where an initial sharp BG rise was followed by a prolonged dip (needing multiple carb top-ups to prevent hypos while the meal dose was working at full strength) followed by a later rise into double figures as the food absorbed when the insulin was on it's way out. Many T1s will be familiar with this 'pizza effect' where the fat delays carb absorption - but suddenly I was seeing it with previously very predictable and cooperative foods. I can't explain why this has suddenly become necessary. I'm not sure I even care to be honest. Especially since breakfast seems to have been entirely unaffected and is proceeding as it always has. Typical type 1 diabetes. It can't actually make sense. It just has to set new 'rules' for that thing, but leave that other thing as it was. And in another month? It could all change again! The good news is that I have made some decent progress in the past few days to find a set of splits and timings of dual wave doses that seem to be working better for lunches and evenings (and reduced dose ratios to boot). I will pop a sensor to see a bit more detail in the next few days. Hope the BG gremlins are giving you all a bit of peace.